Midfielder Sam Foley was delighted to get the chance to show what he is capable of in Saturday’s Sky Bet League Two clash with Cambridge United. With Shaun McWilliams injured and John-Joe O’Toole left out due to a minor knock, the former Port Vale man started in midfield and impressed in the 2-2 draw at the PTS Academy Stadium. It was Foley’s first league two start of the season and he will now be hoping he has done enough to keep his place for Tuesday night’s trip to bottom-of-the-table Morecambe. “I was happy with my performance and it was great to get a game,” said Foley, who has made just 20 starts for Town since joining last summer. “My time here so far has been a bit chequered with injuries and not getting selected last season. Town were left frustrated at the weekend, as they took the lead twice only to be pegged back on both occasions, with former Cobbler Gary Deegan’s late strike ensuring the match ended 2-2. 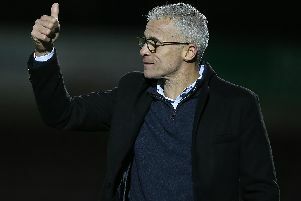 It means Town are still looking for their first win of the campaign, and Foley felt Saturday was an opportunity wasted. “It doesn’t matter about statistics and how well you keep the ball and how many chances you have, it’s goals that depict how the game goes at the end of the day and today we were undone by two goals which we feel were probably preventable,” said the 31-year-old. Town travel to the Globe Arena on Tuesday to take on a Morecambe team without a point or even a goal to their name in the league so far this season. Jim Bentley’s side were beaten 1-0 at Stevenage on Saturday, and that followed on from a 6-0 thrashing on the opening day of the season at Crewe Alexandra and then a 2-0 home defeat to Exeter City. Foley knows the trip to the north west coast gives the Cobblers a great chance to get off the mark, but he says he and his team-mates will not be taking anything for granted. “We’ll pay our respects to Morecambe because they’ll have some strengths,” said Foley. “They haven’t started the greatest, and looking at their form last season, it’s a game we want to take advantage of. “But it doesn’t change, we play our game regardless of the opposition.